We pick up the story of Sarah Eva Howe Salyers where we left off, with the birth of her twins Jim and Mary Alice. Sarah and her husband William L. Salyers now had two sons and a daughter in their happy Carrollton, Kentucky home. It was a joyous time for Sarah, but she had one nagging worry. In the weeks before the twins arrived, her father, Robert James Howe, was not well. He was complaining about stomach upsets and fatigue. 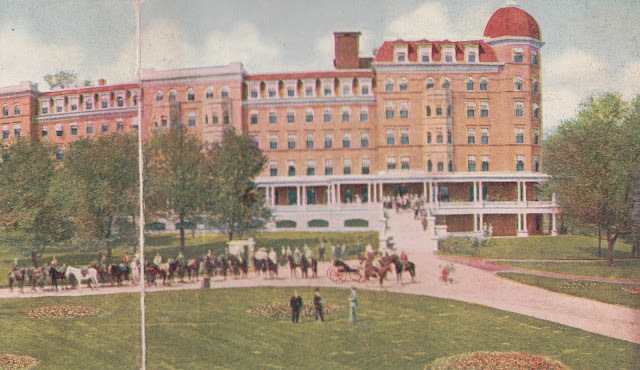 As many people did in those days, he had traveled by train to the world-class spas in French Lick, Indiana, hoping that the area's sulfur-spring "miracle waters" would bring relief. Image from a post card sent home to Carrollton by Robert J. Howe in March 1910. Today I have been recovering from the disorder of Friday. Have been drinking waters hot and cold, walking, chatting, making acquaintances, etc. Visited West Baden again this morning and tried the waters from two of their springs. Mr. John Herrod[?] and Mrs.[?] James Todd of Owenton arrived last night. Took a bath hot sulphur salt glow rub etc. this afternoon. 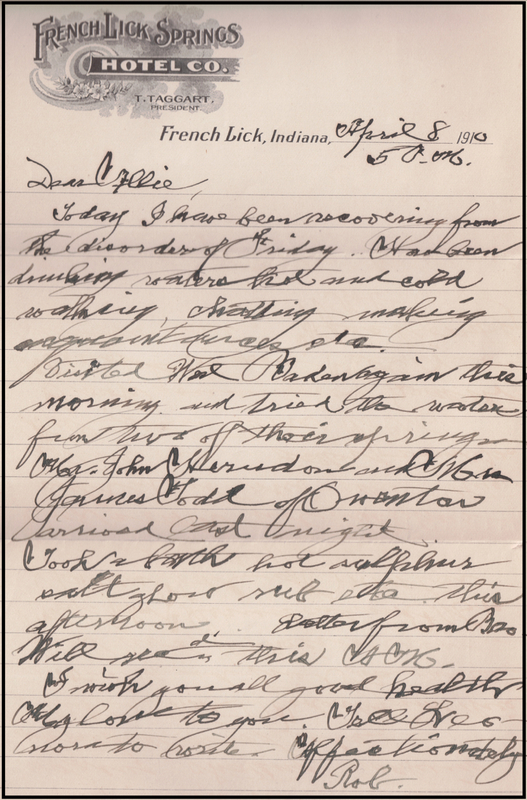 Letter from Bro Will [Rob's brother William F. Howe] rec'd this A.M. I wish you all good health. My love to you. Tell Leonora [Sarah's sister Leonora Alice Howe] to write. In other letters, Rob mentioned headaches, skipping dinner, and drinking "five or six glasses of hot mineral water, which has since been effective . 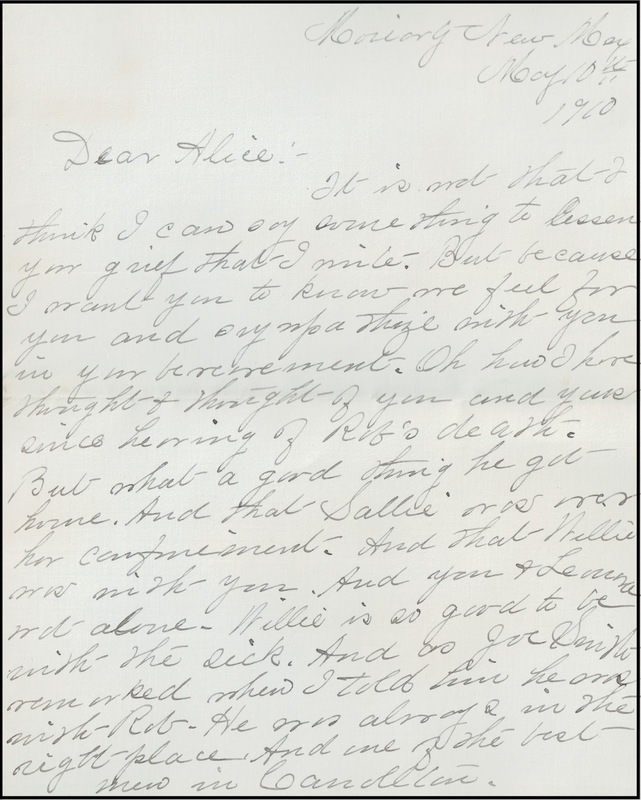 . . " He wrote letters to Alice from French Lick as late as April 12, when he mentioned that he was "nervous" and would share details when he saw her. (I interpret the letter to mean that he was nervous about his health.) He probably left for home soon after that to meet his new grandchildren. Less than three weeks later, on April 29, 1910, he was dead. Although Rob was a prominent citizen and businessman of Carrollton and known throughout the region, I have not found his obituary online. It may have been front-page news in the Carrollton Democrat, as was the news of his brother Joseph B. Howe's death 19 years later. I'll be visiting Carrollton to dig in the archives and will update this post when I find an obituary. Sarah's scrapbooks include many condolence letters sent to her and to her mother. Even though Rob had been feeling below par for a while, the letters indicate that his death was unexpected. I am struck by the outpouring of sadness in these letters – and the eloquence of the writing. Most of the letters sent by relatives and close friends included comments about Rob's deep Christian beliefs, and most expressed concern for Alice and her daughters Sarah and Leonora. Some were especially concerned about Sarah, who was "just over her confinement" after giving birth to twins. 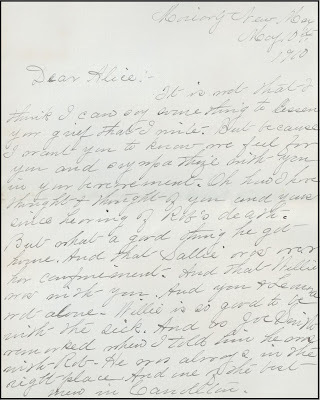 Page 1, Letter from "Aunt Katie"
"It is not that I think I can say something to lessen your grief that I write, but because I want you to know we feel for you and sympathize with you in your bereavement. ... But what a good thing he got home. And that Sallie was over her confinement. . . . The memory of him is so pleasant as he was so kind and good – and what comfort that is to us . . ."
"I wish I was able to say something to help the heartaches, but words fail me so. With the deepest sympathy and may the Lord help you each one in this dark hour." "God's ways are mysterious, and we have only to accept them knowing that it is a 'loving Father.' In this case we know that he was ready always for the summons and to me the quick call is so much more desirable than a long, lingering illness. ... I hope that Sarah was sufficiently recuperated not to have any real harm to her health from the shock." "I was so shocked and grieved to know of your great sorrow, and I want to offer you my love and deep sympathy." "The very sad news has reached me of Mr. Howe's sudden death. How Mr. Howe will be missed. The vacant chair in the home, the empty pew in the church . . . "
"I cannot yet realize it is true . . . I feel I have sustained a personal loss, for he was always a true friend, and they are passing away so rapidly. ... Not only will he be missed at home but wherever he is known." What a fitting post for Father's Day 2017. Sarah loved her father and was, as mentioned in the post dated Aug. 11, 2016, a bit of a "daddy's girl." Today's reflections on her father might remind us of our own. Happy Father's Day to all dads and dad-like mentors out there.